We have eaten a lot of banana before but didn't really know how it is formed. One morning Mamarazzi noticed a weird shaped leaf. Hmmm.... soooo round eh. One day later can see the reddish tip appearing. Three days after that can see two "petals" unfolded. 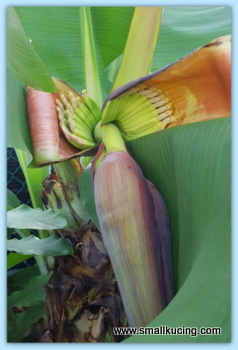 Inside each "petal" there is a bunch of babies banana. So cuteeee~! Each day Mamarazzi peeked. It's been a week and there are around 7 bunches of bananas unfolded. The 8th onwards started to look stunted. maybe it means that the male flowers is forming. A gardening friend taught Mamarazzi to cut off the "heart" once male flowers appear. Maybe he mean this. Now waiting and see if there will be more bananas before cutting off the "heart" . Heard the heart can be use to for salad. 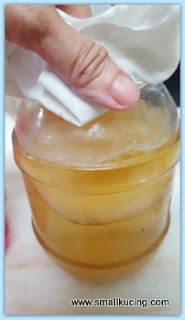 While waiting for the Banana Tree to finish doing strip tease, Mamarazzi is also attempting to make Kombucha. The starter have a strange name called Scoby. Nothing to do with Scooby Doo. Will update you when there is more result. 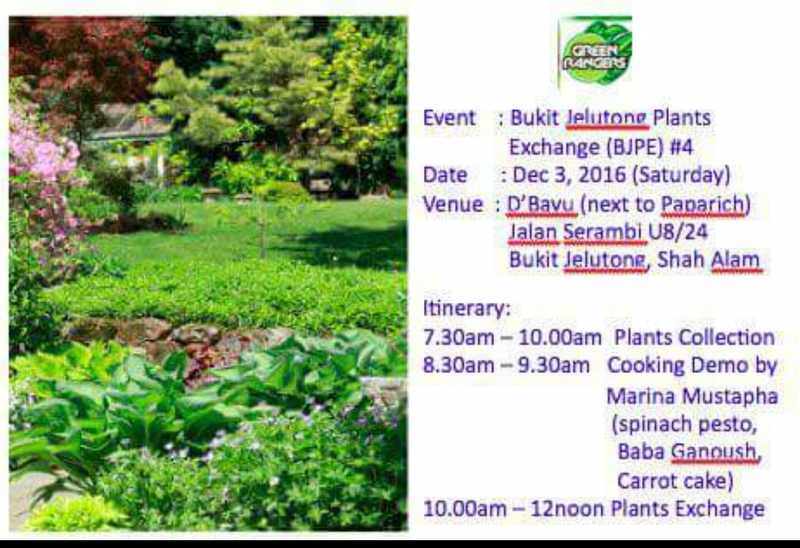 Meantime, if you are free, don't forget to drop by Bukit Jelutong Plant Exchange tomorrow morning ya. Now Mamarazzi is busy labelling the plants. 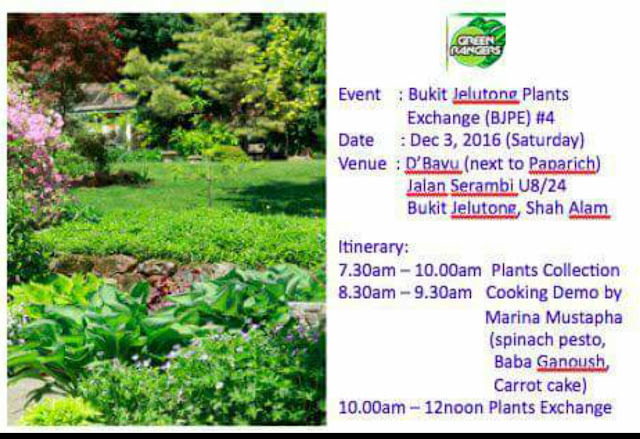 We'll be bringing around 100 plants to be adopted. Curious to see where the heart went! All the best on the kombucha and the plants exchange! 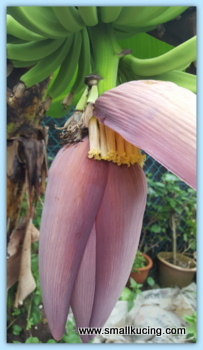 So nice you have banana in your kebun. Yes, got kerabu jantung pisang. But I have never tried that. 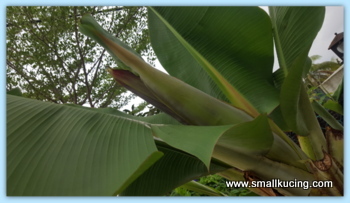 You have a banana tree in your backyard! Wow! Soon, you can have more bananas to eat. kombucha?? Never heard of it. Jakun me. Need to google and check it out. hehe! Couldn't wait for more update from you on this. Wow, fresh bananas from your own yard! How long did it take the tree to grow and get the fruit? Ours is the dwarf banana type. It took around 10months to fruit. Love to hear about your kombucha...I also want to try this. As for growing banana ...I can just envy you for that but I do share your excitement! My mother cooks the banana heart into a pickled vinegary dish....it's so yum! I wonder if you have tried that too? Quite a thing yea with the banana tree. Been trying to plant for so long, then again, mmm? so many plants I want to grow at the same time as well. My kids love bananas, it would be nice if can plant own bananas, kekeke! Live and learn, lil kitten ... Love, cat. 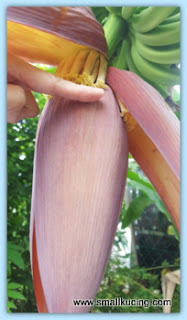 I've never heard of "heart" from banana plant. Interested how it will taste in salad! Strip tease... love this definition haha. Good idea! Never thought of that. So fun and interesting to keep track on your plants fruiting. Which is male or female flower? 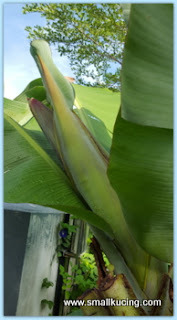 I haven't tried growing banana before. Say male flower is without the buah wor.